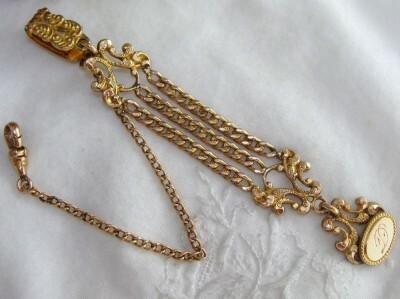 This RARE and Absolutely Stunning, beautifully ornate Ladies’ Antique watch Vest fob chain is in Perfect Working Order and presenting in Excellent, Original condition! It is simply perfect to be paired with an Antique Pocket Watch. It features a U shaped clip at the top designed to fasten to a vest pocket. The repousse detailing or deep embossing on the clip is just beautiful and typical of the late Victorian and Edwardian eras. It is totally intact & functions perfectly. From this hangs a series of fancy links – the pictures provide the best description. At the bottom is a signet charm/wax seal of the same design cappings. It is different to most as it was designed with a flattened appearance. It is engraved with the monogram, D.
There is the chain to which a pocket watch attaches with the clip functioning perfectly with springiness like new. It has that silky smooth feel usually only associated with solid carat gold and to be expected of quality antique jewellery. The gold has a warm yellow hue with pink/rose highlights, especially to the signet charm stamp. Excellent Antique condition and in perfect functioning order. There is little wear and no damage, repairs or flaws to mention. You will be hard pressed to come across such a fabulous example of a piece over 100 years old. You will be thrilled with this fob, the perfect addition to any pocket watch collection.